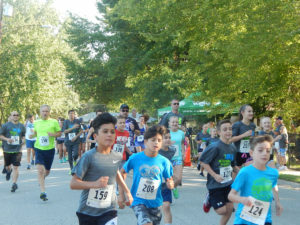 O’FALLON – Last Saturday, O’Fallon First United Methodist Church hosted its second annual Running 4 God 5K, co-organized by church members Rob Stoelzle and Linda Gruchala. Prior to the race, runners, walkers and their families as well as volunteers gathered in the parking lot for last-minute registration, fellowship and leg stretches provided by Dr. Eric Toennies from Chiropractic Plus. With great morning weather, there were no delays keeping the race from starting on time. Not too long after the walkers had begun their trek, running participants of the 5K race lined up along Southview Drive, excited to run for God. Before both walking and running heats, each group of participants began the 5K journey in prayer to bless the race and everyone involved. To read the full article, pick up a copy of this week’s paper on newsstands now. Or, click here for the digital edition.